2005 experienced the launching of FXOpen and since then the company has become one of the most competitive Forex brokers that expands at neck-bending speeds. Ever since the company saw its outset, it has only been loyal and true to its mission to turn trading currency pairs into a more secure, professional, and easier process. Incepted by a team of traders, FXOpen has always revolved around the core interests of traders. Armed with a substantial expertise in trading Forex, the people at FXOpen are both aware of what it takes to arrive at the successful strategy in Forex and the downside that may hinder investors on their dusty, yet exciting, path there. The company prides itself on being the first to offer its customers ECN trading through the MetaTrader 4 trading terminal. Thanks to the FXOpen’s one-of-a-kind technology for price aggregation, its clients may derive great benefit from the most competitive spreads in the niche and one of the lowest commissions in trading. The Level 2 MT4 plug-in and One-Click trading of FXOpen lets clients place trades with a single click. In 2014, the Forex company continued its march to providing the most up-to-date technologies by introducing Bitcoin trading to its B2B and retail clients. FXOpen is determined to providing its clients with the most attractive trading environment, epitomising the industry’s top-notch innovative solution in technology, as well as a quick and error-free order execution. For this reason, from savvy to absolute novice traders, FXOpen presents a number of trading accounts to address any demand irrespective of how fastidious it can be. There is a Micro account, having no commissions, a minimum deposit of just $1, floating spreads, and instant execution. In addition to all those, there are mini and micro lots, 10% Stop Out level, 20% Margin Call level, hedging, expert advisors, and 28 currency pairs + silver and gold. The STP account at FXOpen begins at a minimum of $10. There is no commission and there is a floating spread. Market execution, no-requotes, mini and micro lots, demonstration account, a 50% Margin Call level, a 30% Stop Out level, hedging, scalping, news trading, and phone dealing are the additional perks of this account. The ECN account is the FXOpen’s most popular. Its commissions are 1.5 units per lot and the spread is floating, commencing from 0 pips. 50 currency pairs, silver, gold, CFDs, and indices are the trading instruments. True ECN accounts do not qualify for bonuses, but they are eligible for hedging, expert advisors, scalping, phone dealing, and news trading. The Crypto account is characterised by tight floating spreads, a 0.25% commission of the transaction volume, 24 Crypto pairs, deposits beginning at $10, and mini and micro lots. In addition, the Crypto account gets phone dealing, news trading, scalping, expert advisors, and hedging. All accounts save for the Crypto can be turned into an Islamic account in compliance with Sharia stipulations to be swap-free and with no commissions and fees. Again with the exception of the Crypto account whose leverage is 3:1, the leverage for all others is up to 500:1. More than 2/3 of all Forex brokers provide its clients with the MT4 terminal and more than 90% of retail transactions on the Forex markets are executed via this platform. Year after year, the MetaTrader 4 continues to receive prominent awards since 2005. 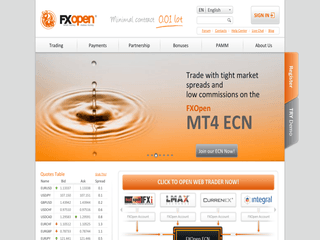 FXOpen became the first Forex broker to offer its investors a direct access to ECN trading and Interbank liquidity through the MT4 platform in 2009. The proprietary and revolutionary solution – the Liquidity Aggregator – of FXOpen fully utilised MT4’s capacities. Nowadays, FXOpen guarantees an error-free and instant order execution at top-notch prices from over 10 liquidity providers and banks. FXOpen’s MT4 is also very beneficial for the Micro and STP accounts, providing both manual trading via directly placing trades from a price chart and an automated trading through the help of expert advisors and ready-made scripts. Users of these accounts also derive advantage from the simple, yet powerful, MQL programming language; from over 50 built-in graphic tools and indicators for technical analysis; and charting – in the form of candles, lines, or bars. FXOpen assiduously punches above the competition’s weight when it comes to customers’ security. The Forex enterprise is duly registered on the island of St. Kitts and Nevis and is a proud member of The Financial Commission. Furthermore, in Europe, FXOpen Ltd. abides by the strict regulations of the Financial Conduct Authority while in Australia, the Australian Securities & Investments Commission is charged with overseeing FXOpen AU Pty Ltd.
To further tighten clients’ safety, FXOpen employs account and eWallet verification which typically needs 48 hours and requires an address proof and a photo ID. Not only does FXOpen believe in a trader-oriented attitude with a strong focus on security but it also guarantees excellent customer services which epitomise attentiveness and a friendly, yet professional, approach. A live help, an e-mail assistance, and several fixed phone lines are at client’s disposal to tackle any issue which might hinder the trading environment. The website of FXOpen speaks English, Arabic, Chinese, Farsi, French, German, Indonesian, Ukrainian, Turkish, Spanish, Russian, Portuguese, and Malay. FXOpen gives a wonderful selection of deposit options. First of all, there is a Bank Wire whose currencies are USD, GBP, AUD, RUB, CHF, EUR, and JPY while the minimum deposit is $25. There are also Local Transfers for Latin America (in MXN, BRL, CLP, YUY, and PEN), Netbanx Asia, and instant Local Bank Transfers whose minimum deposit is $1. China UnionPay (min $1), Credit and Debit Cards (MasterCard, Maestro, JCB, VISA Electron, Discover, and VISA – min $1), ePayments (min $1), Electronic Payment Systems (WebMoney, NETELLER, Skrill, Qiwi, PerfectMoney, Payza, SorexPay, Yandex.Money, FasaPay, IntellectMoney, OKPay, and RBK Money – all of them instantaneous), Prepaid Cards, and Crypto Currencies (Bitcoin, Litecoin, Namecoin, and Ethereum). Withdrawals at FXOpen can be executed via Bank Wires (1-3 business days processing), Credit & Debit Cards (up to 24 hours), ePayments (up to 24 hours), Electronic Payment Systems (up to 24 hours), and Crypto Currencies (up to 24 hours). FXOpen has recently changed its deposit bonus system to embrace some needed alterations. For every trading account, these bonuses are contingent upon some conditions, such as trading at least 100 Micro lots, etc. In addition to those, FXOpen also hosts the ForexCup Trading Contest Bonus whose prizes are then added a user’s live account. The prizes and bonuses are paid to those contestants who have secured a place among the prize winners whose number varies from contest to contest.